This couscous satisfies your pasta cravings, but contains one-third of the calories of regular pasta, and less than a third of the carbs. If you're like us, carbs are all you want to eat in the winter. 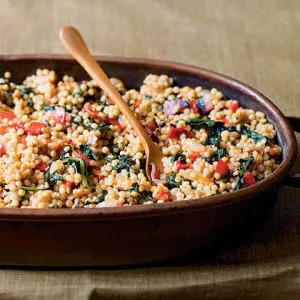 This couscous recipe is an excellent compromise: it satisfies your pasta cravings, but contains one-third of the calories of regular pasta, and less than a third of the carbs. This dish is made with olive oil, onion, and garlic. Olive oil is a much healthier option than butter (which is used in some couscous recipes), and it strengthens the immune system to help protect against viruses such as the flu. (And, right now, we bet you could use all the germ protection you can get!) Olive oil has also been linked to fighting heart disease, diabetes, and obesity. Garlic and onion not only add to the complexity of flavor in this dish, but they also boost heart health, and are reported to have anti-inflammatory, anti-bacterial, and anti-viral benefits. When you combine these two veggies with olive oil, your flu-fighting artillery is fully locked and loaded. The final ingredient that deserves your attention is spinach. The nutritional content of this superfood is off the charts: it contains almost 1000% of your daily value of vitamin K, which supports bone health, and it's packed with vitamin A and manganese, which are powerful antioxidants.